The Homgrace Standing Desk was designed to assist those who are challenged with back, neck, posture, and circulation problems. It provides multiple height desktop work levels to maximize comfort, introduce work height variations, optimize posture / natural blood circulation, and reduce eye strain. Homgrace provides you an easy, quick, affordable way to switch position from sit to stand. This will prevent from prolonged sitting while working and allowing you to function under a most ergonomic standing position. There are various placement options for convenient use of your laptop, notebook or tablet. When lifted into the standing position, the 31.5 X 20.5 surface allows you to work comfortably. Finally a desk that is sturdy but also light-weight and compact. This height-adjustable desk sits on top of your existing desk and allows ample room to work comfortably yet small enough to fit most workspaces. Note: Please allow 1-3cm error due to manual measurement and make sure you do not mind before ordering. ▶A Silky-Smooth and Quiet Z-lift Mechanism with infinite stops - creating 6 inch to 16.2 inch height range adjustability, fast and easy to move from sitting to standing height. ▶Grab your computer and place it right on top of your new stand up workstation, using the modern single flat surface for ergonomic comfort and increased productivity! ▶Extremely Stable and Portable - Made of aluminum aolly, has undergone extensive testing for balance, supports up to 35 lbs. The stand up workstation rises and folds vertically, within its own footprint, taking up no more space than your office desk. 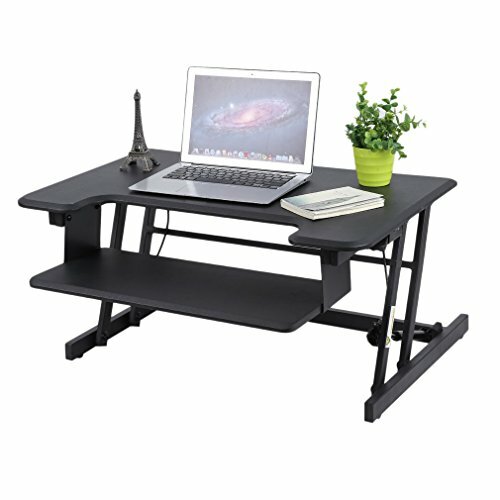 ▶Multiple Uses - Table Can Also Be Used For a TV Dinner Tray, Sound Equipment, Projector, Standing Desk, Book Tray, Writing Desk, and Tablet Holder. Includes Non-Slip Feet For Use On Tabletops and Desktops. ▶Comes fully assembled right out of the box - no assembly, installation, or tools required! basyxamp;reg; - BL Series Credenza Shell, 60w x 24d x 29h, Medium Cherry - Sold As 1 Each - Durable 1amp;quot; thick tops covered with abrasion- and stain-resistant laminate.